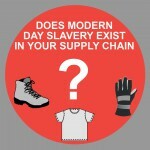 ARCO, a leading UK safety company, has announced it has made a call to businesses urging them to ask their suppliers about their ethical assurance measures, in particular about due diligence processes in relation to slavery and human trafficking in their business and supply chains. Arco says latest figures show that there are more than 45.8 million people in a form of modern slavery across 167 countries and says it takes its ethical responsibility seriously and was the first distributor within the industry to become a member of the Ethical Trading Initiative (ETI). Arco joined the ETI in 2007, forming part of an alliance of leading companies, trade unions and voluntary organisations.